Burroughs Adding Machine Company, 6071 Second Av., Detroit, Michigan, U.S.A. In 1886 the American Arithmometer Company was founded in St. Louis to manufacture the mechanical add-listing machine invented by William Seward Burroughs. These precision machines were very successful, and in 1904 the company moved to larger premises in Detroit. The following year the name was changed to Burroughs Adding Machine Company. Other manufacturing plants included those at Nottingham, England (1898); Strathleven, Scotland (1953); and Villiers-Ecalles, Normandy, France (1959). The early Burroughs models were large machines characterised by having glass panels in the sides so the mechanism could be seen. This became fashionable in other company's machines of the time. There was constant development in the mechanical calculators through to the 1960s, when Burroughs converted to electronic desk calculators. They had an agreement to sell in Europe electronic calculators made by Sharp in Japan, but also decided to make their own electronic desk calculators at their factory France. The company was heavily involved in accounting machines, had had early involvement in computing equipment, and the calculators appear to have been dropped from its product lines in the mid to late 1970s. It only produced desktop machines, and no hand-held calculators. In 1986 Burroughs Corporation and Sperry Corporation merged to form Unisys Corporation. This is a full-keyboard add-lister made for calculations in the old Sterling currency (£sd). 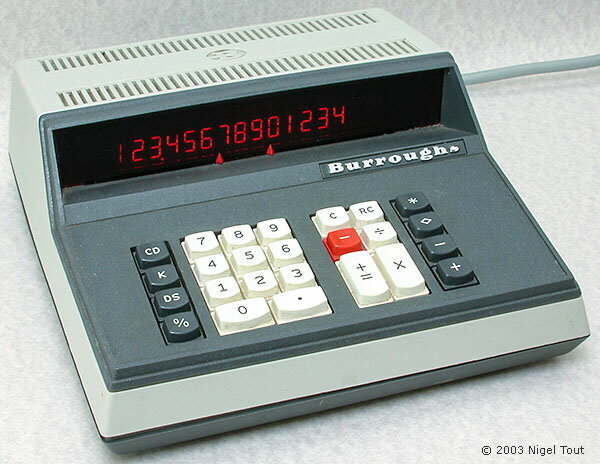 Models similar to this were made for many years until ousted by electronic printing calculators in the 1970s. This machine, with a "Panaplex II" discharge display dates from about 1972/3. For further photographs of Burroughs calculators see the Calculator Photo Library on this site.